Are ladies allowed to replace as "Panj Pyare" if there are not enough amirthari? As per Sikh Rehet Maryada (the only Rehet Maryada accepted by Akal Takht and arrived at by Panthic decision with input from all sects and jathas.... by the way panth was given FULL rights to decide on things on behalf of the Guru) in SRM it explicitly says male or female. And in the Rehet Maryadas of so called puritan sampradas, it's never explicit. It's implied. Guru Gobind Singh Ji has never said "no I don't allow females... " and to use the first five as a reason suggests that the first Amrit was all about a competition between genders and that now for females it's punishment. Amrit in 1699 was not about any completion. And simply having the same 'parts' doesn't make you more qualified. Big news! NOT a single one of us was there that day to give our heads! And the other thousands and thousands of people including all the rest of the men also didn't give their heads 'when the call was made' as one of the first five. Why does having the same thing between your legs make you more qualified now??? Feel entitled??? Just like the first five were the same gender they were also same skin colour. But are Caucasian or black or oriental males prohibited because no one with the same skin colour gave heir head that day???? The first five very likely all had brown eyes based on ethnicity, but does hat mean no males with blue eyes or green eyes can administer Amrit now because no green eyed or blue eyed males gave their head that day?? That's how ridiculous this is!!! Well spoken! You have hit the nail squarely on the head. Thank you. satshri akal ji Panj Pyare can be ladies or men or combination, the only requirement is they (ladies or men) should be amritdhari. singh ji there are 5 piyare not panj piyarian or 2 piyarian and 3 piyare ..ladies not allowed as mariyada....but it does not mean that they dont have equal respect ...even they are as awesome as singhs,,,,but now days people dont understand the true meaning hence they create new mariyada ...it looks interesting that you dont have even 5 amritdhari gursikhs. according to akal takhat maryada, a girl can because it says any "SIKH" can do panj pyare de seva. But, if you you are going by puratan maryada they are not. i'm sure not of the reason. The way the question itself is put reveals our plight. Somewhere...deep down ..we'll not let ladies come forward .... I am referring to the usage of 'replace as' and 'IF THERE ARE NOT ENOUGH AMRITDHARI' . You know what these kind of questions are called ..ones that inherently make u assume a false premise in a manner that eventually whether you answer a yes or no, you are already failed cause you fell in the trap of assuming the intricate assumption. ਥਿਰੁ ਘਰਿ ਬੈਸਹੁ ਹਰਿ ਜਨ ਪਿਆਰੇ ॥ Remain steady in the home of your own self, O beloved servant of the Lord. Now why is Guru Sahib talking only to men here, and not women? Does it mean women are already steady but men are not? To be honest there is two answers to your question, The older Sikh population is still practicing the old practices of caste discrimination and gender discrimination, whereas the younger Sikh population as well as western educated Sikhs have become more open minded and accepting of people. 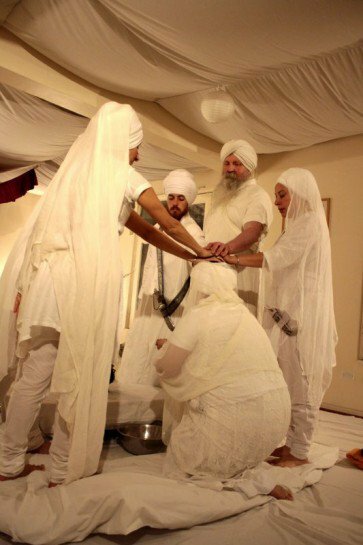 For example the only gurdwara in the world where Sikh women are part of panj pyare and hold sri Guru Granth Sahib ji on their head during sukhasan is in Espanola, New Mexico(Same Sikhs who are running this very site). Words i m going to mention was once said by sant jarnail singh ji khalsa bhindranwale while answering to the same question asked by an amritdhari women ......baba ji said....sikhism is the only religion where women get freedom to worship god....not so like other....but when it comes to be in panj piare ,then it is no ..because,when on the day of baisakhi guru gobind singh ji maharaj brought talvaar in deevaan....he asked for a head(for sacrifice) he didnt mention whether of men or women.....bas ik sees chahida a....at that time the persons who got ready for that...5of them were men(whom we call as panj piare)....sant ji said ..if @ that time a women had standed for sacrifice...then today we would have seen women in as panj piare. Wähégùrü jî kå kha£$ä,wàhëgürú jí kî fâtêh.ji. Guru Gobind Singh gave one Amrit. 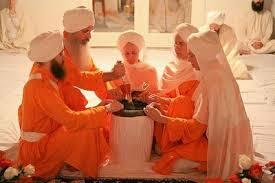 Now, we have so many Amrits Akal Takhat Amrit, Sant Amrit, Jatha Amrit, etc. 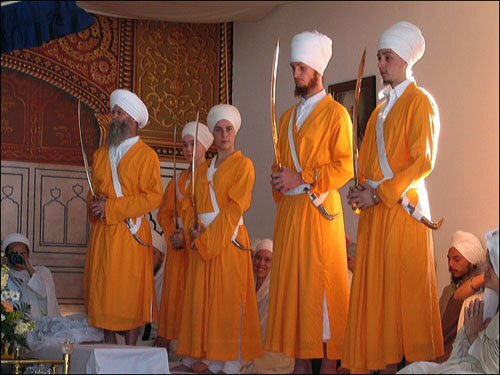 why is there such a conflict about what an Amritdhari should do or should not do?